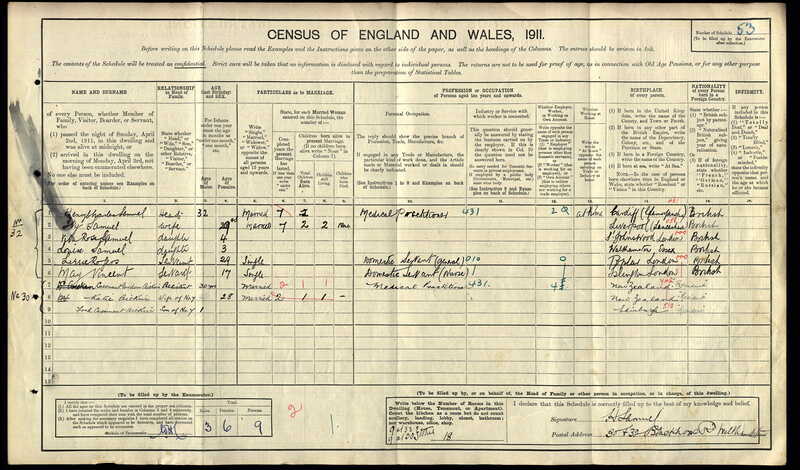 Ivy Gertrude Reis was born in 1881 at Birkenhead, the daughter of Arthur Montagu and Lillian (Samuel) Reis. She married Dr. Henry Charles Samuel in 1904 at Kensington, London. 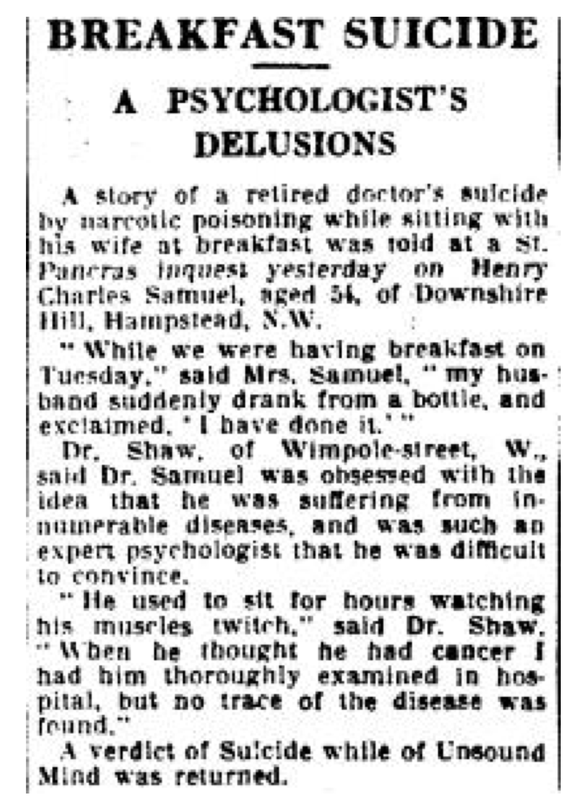 Henry was born in 1879 and he committed suicide on 8 June 1933 at 38 Downshire Hill, London, NW3, at age 54 and was buried on 9 June 1933 at Hoop Lane Cemetery, Golders Green, London, N11. 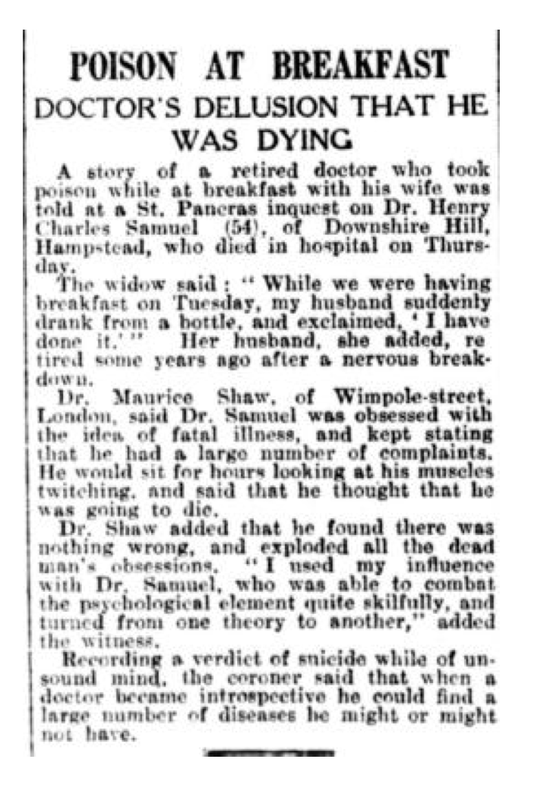 Ivy died on 15 July 1951 at West London Hospital, Hammersmith, but was resident at 138 Sinclair Road. Henry died in 1933. Louise Joy (Lulu) Samuel, the daughter of Henry Charles and Ivy Gertrude (Reis) Samuel was born in 1908. She married in 1933 the film director Raymond Egerton Harry Watt. They had one son: Christopher Harry Anderson. Some notes on Harry: He worked in the 1930’s with the EMB GPO film unit, directing several of their most celebrated films (Night Mail, 1936). Wartime documentaries (Target for Tonight, 1941), then to Ealing as director; after the war, his five Ealing films were all shot in Africa or Australia. Went to TV briefly in the 1950’s; later, returned to documentary. Nine Men (1943) – Superb war drama focusing on a group of British soldiers fighting against Axis troops in North Africa who must fend for themselves when their commander is killed. Produced by Ealing Studios, the film stars Jack Lambert and Gordon Jackson. 65 min. Fiddlers Three (1944) – Amusing time-travel comedy in which two sailors on leave attempt to find refuge from a rainstorm by ducking under an altar in Stonehenge. When the altar is zapped by lightning, they are thrust back to Ancient Rome, where they delight the empress with their predictions…but soon face death in the lions’ den. Tommy Trinder and Frances Dey star in this Ealing Studios farce. 88 min. The Overlanders (1946) – A beautiful, true-to-life adventure set in Australia during World War II. With the threat of a Japanese invasion hanging over their heads, a group of brave people lead 500,000 head of cattle cross-country to safety. Featuring gorgeous scenery and a stirring score, the film stars Chips Rafferty and John Nugent Hayward. 91 min.